This is how I make my slow roasted tomatoes. It works for any vegetable, however, the roasting time depends on the size and also the density and water content of the vegetable you choose to roast. 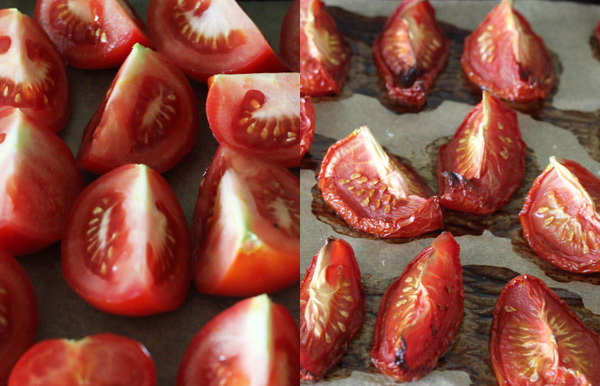 Anyway, to get back on the tomatoes – this is how I create roasted, yet juicy tomatoes which I add as a flavour enhancer to anything from stews, to salads and soups. Slice the tomatoes into equally large sized chunks. I quarter my “ordinary sized” tomatoes, cherry tomatoes I just slice in half. 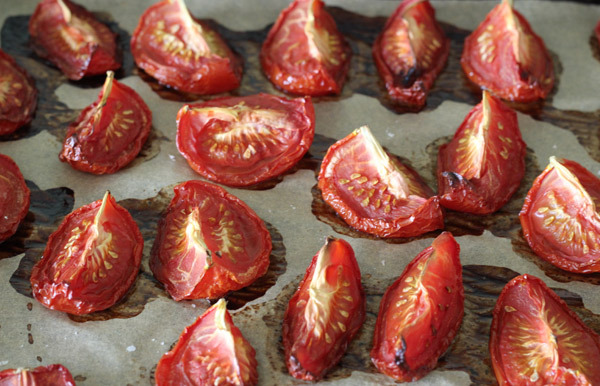 Place the tomatoes on a baking tray covered with a baking paper. Ensure the tomatoes are evenly spaced on the tray. Sprinkle some sea salt over the tomatoes. You can add oil and spices etc if you want before you place the tomatoes in the oven, to further enhance flavour. I only do salt usually. Place your tomatoes in the oven, activate the heat. I usually go between 150-175 C/ 302-347 F depending on the size of the tomatoes. usually I stay at 150 C/302 F.
It will take between 1,5- 3 hours. Depending on size before the tomatoes are ready. During this time, make a habit to open your oven door every half an hour in the beginning and then more frequently towards the end – to let some steam out. The tomatoes are ready when they are semi dried, that means they should not be entirely dry, they should still have some moisture in them. Note: I use a fan assisted oven. The temperature is therefore slightly lower then in an ordinary oven, or a gas oven. Go lower if unsure. Also, in using a fan assisted oven I can roast several trays at the same time.